According to Socrates, knowledge is "food for the soul." That's all well and good for the Socratic but, according to Maslow, food for the stomach is a far more pressing matter. —Enjoy fresh homemade lamb meatballs and tzatziki, and the simple pleasures of life in Epicurus's ancient Greek garden. —Practice nonviolence (in life and at the dinner table) while sharing tofu curry with Burma's Aung San Suu Kyi. —In the spirit of accepting change, ditch the familiar take-out containers and dine on homemade shrimp dumplings with China's Lao Tzu. Complete with McCarty's recommendations for ethnic music from each region to enjoy during your gatherings and discussion questions to prompt debate, The Philosopher's Table contains everything you need to leave your host's home brimming with both nutritional and mental satisfaction. Marietta McCarty is the author of Little Big Minds: Sharing Philosophy with Kids (a New York Times Extended List bestseller) and How Philosophy Can Save Your Life: 10 Ideas That Matter Most (Winner of the Nautilus National Book Award). For over two decades, she taught philosophy at Piedmont Virginia Community College in Charlottesville, Virginia. Now a writer by trade, she travels around the country speaking and hosting events about philosophy to groups of all ages. "The Philosopher's Table is enchanting...a bulls-eye gift. Very small. Very smart. Very self-assured." 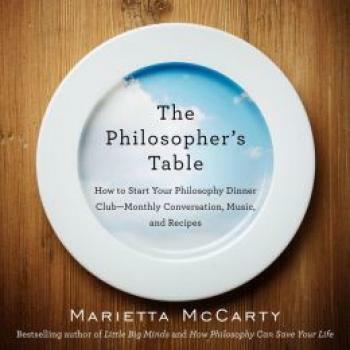 "For anyone who fears philosophy or feels unable to find an entry to philosophy, [McCarty] provides an easy way in through culture, music, food, and conversation. The writing mirrors the subject matter: clear, thoughtful, musical, sensory. The author gives, and the reader gets..."